The furnace blower motor, regardless of the type of furnace you own, will have one function — to circulate the air throughout your home via the ductwork. This part is responsible for forcing the air over the heat exchange when heat is needed or over the evaporator coil in the case of needing air conditioning, eventually moving throughout the ductwork, heating or cooling your home. If this part breaks or malfunctions, which is often the case since the part works so often, then the air will not be able to circulate throughout the air, leaving you with either a very cold home in the winter months or warm home during the summer months. How much does a furnace blower motor replacement cost? The costs to replace the furnace blower motor will depend on a few factors, including the type of blower motor required, the contractor you decide to hire and your geographical region. Based on these factors, the costs, including both parts and labor, can range anywhere from $250 to more than $500 for a standard single speed blower motor. If a blower motor is required for a more expensive unit, such as a variable-speed motor, then the costs could be more than $1,000; however, these motors tend to be relatively rare. While most of the jobs are often straightforward, it doesn’t hurt to receive multiple quotes from licensed HVAC professionals in your area to make sure you’re getting the best value and service. If you do not have the time to research these professionals, then we highly recommend HomeAdvisor.com, a free comparison tool that allows you to explain your job and watch quotes come in based on your job description. It’s free, no credit card is required and it’s a fantastic way to save time. Most of the costs will rely upon the labor as the cost of the part can often be as little as $75, with most jobs taking about two hours performed. Being a dangerous job, this is not considered to be a DIY job and should be left up to a trained and licensed HVAC technician. If you’re lucky enough, the repair may rely on the capacitor/s that’s located inside of the blower motor. This part, acting similar to that of a car’s spark plug, will create the necessary energy in order for the motor to work as it should. As these capacitors can undergo a lot of wear an tear, this part can fail, and instead of replacing the entire blower motor, the capacitor can be replaced for as little as $175 to $250. The signs of a bad capacitor can often include a burning smell, clicking-like sound and/or the blower motor seems to function but will not turn on all of the time. All brands of furnaces, with the exception of Lennox, will use the same internal components, meaning it can be easier to use other name-brand parts to help you save money. 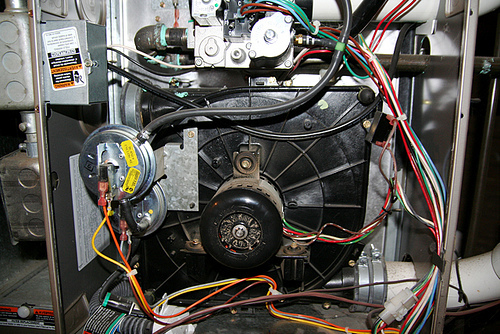 To extend the life of your blower motor, it’s highly advisable that you have your furnace inspected annually. To know if you’re getting a good deal, search for the blower motor for your specific make and model and then, with the part prices, add another $200~ to the price for labor to see if the contractor is offering a fair price in your area.